The BHS arranges a number of meetings and other events for its members throughout the year. These are listed in the Diary below, which also includes previous meetings in order to let non-members get a feel for our activities. For upcoming visits, please contact the person indicated to book a place. Entries marked * are not organised by the BHS. See also our page Regular Events. Please note that it is the responsibility of members and their guests taking a BHS arranged visit to organise their own insurance cover. Wear suitable footwear for maltings and brewery visits. The buildings may be several storeys high with no lifts. Floors are often wet and uneven. Town walks and touring such premises are not recommended for any persons with disabilities or heart conditions. The BHS supports sensible drinkaware policies. This page updated 7 April 2019. The BHS will be attending SIBA BeerEx UK at Exhibition Centre, Liverpool L3 4FP. See us at Stand 130. 2pm BHS visit to Gadd's Brewery, The Ramsgate Brewery, 7 Pysons Road Industrial Estate, Hornet Close, Broadstairs, Kent CT10 2YD. 11am for 12 noon Brewery History Society AGM at Shepherd Neame Brewery, 17 Court Street, Faversham, Kent ME13 7AX. Contact visits@breweryhistory.com. All members are of course welcome to attend the AGM. 11.30am BHS visit to Banks's Brewery, Brewery Road, Wolverhampton WV1 4JT. We meet at the Brewery Shop at 11.30am. From 8.45am Joint event: Brewery History Society and the British Guild of Beer Writers. "Malt, Past, Present and Future". The Guild and the BHS are meeting at Norwich's City of Ale Festival for an in-depth seminar on beer's main ingredient. Start at Norwich Station at 8.45am. Tickets are �. To reserve your place and for more information, please email secretary@beerguild.co.uk. Ken Smith's Urban Walk to Southwalk. Southwark Bridge to Tower Bridge (the Hop Exchange, Courage and a non-beer brewery). Ken Smith's Urban Walk: Barbican to St Pancras. Whitbread, Cannon Brewery, etc. 2pm BHS visit to Bateman's Brewery, Wainfleet, Lincolnshire. Ken Smith's Urban Walk: Vauxhall to Chelsea. New London, Chelsea Brewery, etc. This 'walk' includes public transport. Ken Smith's Urban Walk: North London: Seven Sisters to Tottenham. Wooldridge, Grippers and a Fremlin intrusion. 7.15pm * Wem Civic Society meeting at Chapel Street, Wem, Shropshire. Open Forum led by BHS member Stan Platt; Shelagh and Oliver Richardson: Breweries Past and Present - Herefordshire to N Wales via Shropshire. Starts at 7.15 pm - moderate charge. 11.00am BHS visit to Wrexham Lager Brewery, 42 St Georges Crescent, Wrexham LL13 8DB. We meet at 11.00am at the Brewery Gate for a brewery tour to view Processing, Packaging and Laboratory. A presentation from Martyn Jones from Wrexham Lager Brewery: Martyn is now a consultant microbiologist and was previously the MP for Clwyd South and bought the rights of Wrexham Lager from Carlsberg for � Know your CAMRA - Ian Ogden; Wrexham Lager Brewery Past and Present; Lager Tasting. The visit is expected to finish at about 1.30pm, and those attending should make their own arrangements for refreshment after the visit. 11.00am to 12 noon * Buckinghamshire Beer & Brewing. One of a series of free talks about records held at the Centre for Buckinghamshire Studies, County Hall, Aylesbury HP20 1UU. We are proposing to meet on Tuesday evening at a city centre restaurant which sells local beer. On Wednesday, we are hoping to visit a modern microbrewery; and then we will visit the historic Dreher S鰎gy醨ak brewery. Anton Dreher was an Austrian brewer who was an important figure in the development of pale lager. In 1840, he invented a new style of beer that became known as the Viennese style, still one of the major beer-styles of Europe � his name lives on with the Hungarian brewery. On Thursday, we expect to visit a central specialist craft beer pub; and later the Kaltenberg brewpub, which was founded in the dying days of Communist rule by the German brewery of the same name. On Friday, there will be a visit to a 'Ruin Bar' which serves many interesting beers; and in the evening, a farewell meal in a city restaurant. Participants will travel to and from Budapest under their own arrangements, but hotel accommodation can be arranged. Return on the Saturday, or later if you wish. From 11.00 am * Tipplefair 2018. Tipplefair 2018 will be held at the Heron pub, Southfields Drive, Stanground, Peterborough PE2 8QB. Stallholders from 10am; customers from 11am. This is an essential event for all breweriana collectors. From 12.00 noon BHS visit to Titanic Brewery, Burslem. We meet from 12 noon at the Bulls Head, 14 St Johns Square, Burslem, Stoke-on-Trent ST6 3AJ. 10 minutes walk to the brewery for a tour. There will be a charge of �.00 which includes a bowl of Lobby (stew) and three pints of Titanic Ale. Tour guide Mr Malcolm Hawksworth will then give a talk about his experiences running the Old Crown at Hesket Newmarket, the first Community pub in the country. 1.30pm for 2.00pm BHS visit to Burning Sky Brewery, Place Barn, The Street, Firle, East Sussex BN8 6LP. From 11.00am for 12 noon Brewery History Society AGM at Harvey's Brewery, Cliffe High Street, Lewes, Sussex BN7 2AH. Meet at the John Harvey Tavern, opposite the brewery from 11.00am. All members are of course welcome to attend the AGM. 11.00am A walking tour around the brewing heritage of Lewes, led by our President, Miles Jenner. Meet in the Harvey's Brewery Yard at 11.00am. 12.00 noon BHS North-West Group meeting at 4T's Brewery, Lower Wash Lane, Latchford, Warrington WA4 1PL. We hope founder John Wilkinson will be present with another speaker from the local industry. 1.30pm Brewing in Oxford. A two-hour walking tour commencing 1.30pm from Oxford Railway Station led by local historian Liz Woolley (http://lizwoolley.co.uk/guided-walks). The tour includes a visit to The Queen's College and a talk from the librarian, Robin Hobbs, about the history of brewing at the college. There will be a charge of �for each participant (20 max.). 10.30am BHS visit to Tuckers Maltings, Teign Road, Newton Abbot TQ12 4AA. Regrettably, Tuckers Maltings are to close towards the end of 2018. From 10.30am to 4pm Joint BHS / British Guild of Beer Writers Conference at the Button Factory, 25 Frederick Street, Birmingham B1 3HH. The Pub: Evolving or Dying?. This seminar, organised with the British Guild of Beer Writers, looks at the evolution of pubs and the societal changes and other influences that have shaped their development. The speakers include Mike Hailwood, David Bruce, Geoff Brandwood, Karl Chessel, Sue Martindale and Charlie Rawlings. The event is free to BHS members. 9.30am to 4.30pm * The Association for Industrial Archaeology "Creative Reuse of Industrial Buildings Seminar" at the University of Salford, including a presentation on the award-winning Clementhorpe Maltings. 10.30am BHS visit to Timothy Taylor's Brewery, Knowle Spring Brewery, Queens Road, Keighley, West Yorkshire BD21 1AW. Meet at the brewery at 10.30am for a tour of the brewery, followed by sampling. 11.30am BHS North-West visit to Bowland Brewery, The Beer Hall, Holmes Mill, Greenacre Street, Clitheroe, Lancashire BB7 1EB. We will have a brewery tour at about 12 noon. Meet at the Beer Hall at around 11.30am (the pub is open at 11.00). Please email claire@banktopbrewery.com for more details and if you wish to attend. From 10.30am * CAMRA's 33rd annual National Breweriana Auction at Burton on Trent Town Hall. Apart from the auction, which commences at noon, there will be a number of stalls selling brewery memorabilia. Plus beer of course! 11.00am BHS North-West Regional Meeting: "Ale and Wigan Pie." - Wigan Prospect Brewery. Meet at Wigan Central for 11.00am. From 12.00 noon * Joint meeting of the Labologists Society and the ABBC (Association for British Brewery Collectables) at the Royal Oak, 44 Tabard Street, London SE1 4JU (near Borough tube station). A social afternoon with breweriana, good beer (Harvey's) and good food! BHS members welcome. A walk around Cowes on the Isle of Wight exploring the historic brewing and pub heritage of this town. This is a joint venture between the BHS, Cowes Heritage - which has produced an excellent book on the pubs of Cowes - and the Isle of Wight branch of CAMRA. 11.00am BHS visit to Pope's Yard Brewery, Unit B5b, 477-479 Whippendell Rd, Watford WD18 7PU. 11.00am BHS visit to Phipps NBC, The Albion Brewery, 54 Kingswell Street, Northampton NN1 1PR. 11.00am BHS North-West Regional Meeting: Newsletter and Meanderings - Martland Mill Brewery's Tap 'n' Barrel, Hallgate, Wigan WN1 1LR. 11.00am Ken Smith's Southwark Urban Walk: A re-run (walk!) of Ken's tour of Southwark. Meeting at 11.00am on Southwark Bridge, we see the Hop Exchange, and the remains of several breweries, one of which has been renovated but never brewed a pint! 2.00pm BHS visit to Harbour Brewery: Harbour Brewing Company, Trekillick Farm, Kirland, Near Bodmin PL30 5BB. From 11.00am Brewery History Society AGM at St Austell Brewery, 63 Trevarthian Road, St Austell, Cornwall PL25 4BY. Meet at the brewery from 11.00am. The AGM is held at 12 noon, followed by lunch and a brewery tour, then tasting. 2.00pm BHS informal visit to the Blue Anchor Inn and Brewery, 50 Coinagehall Street, Helston, Cornwall, England, TR13 8EL. Dating back to the 15th century, the Inn boasts 600 years of brewing! Originally a monks' rest house, which produced a strong honey based mead, it now produces a variety of 'Spingo Ales' to traditional recipes. We meet at the pub at about 2.00pm. 2.00pm BHS visit to the Greene King Archives at Greene King's Brewery, Westgate Street, Bury St Edmunds IP33 1QT. Meet at the brewery tap at 2.00pm. Following our visit last year, this is an opportunity to view the brewery archives which include records from Greene抯 and King抯, and Greene King after the merger, also records from Morlands, Hardy & Hanson, Wells & Winch, GK Biggleswade, Rayments Furneux Pelham and Panton Brewery Cambridge. 11.30am BHS walk around Ventnor looking at the town's brewing and pub heritage with talks and a look at the Burt's display in the Heritage Centre. Costing �entry to the Heritage Centre to include a free copy of 'Inns & Ale from Bonchurch to Chale'. Meet at 11.30am at the Crab & Lobster, Grove Road, Ventnor, Isle of Wight PO38 1TH. Based in Prague for four days, we meet in a suitable hostelry on the Tuesday evening. The draft itinerary includes two or three visits on the Wednesday, a visit to Pilsner Urquell on the Thursday, and a visit to the Brewing Research Institute on the Friday. From 12.00 noon * Tipplefair 2017. The Pub History Society will hold this event on the Saturday of the Peterborough Beer Festival, The Embankment, Embankment Road, Peterborough, PE1 1EF. This is an essential event for all breweriana collectors. * As part of Burnley Beer Week, BHS member John Ingham leads a walking tour around six of Burnley's former brewing sites, meeting at The Bridge Bier Huis at Noon, ending at the Ministry of Ale - home of the Moonstone brewery. Followed from 3pm with a Q&A session. Burnley Beer Week includes many other events including brewery visits and tastings. East Lancashire CAMRA website for more information. The Brewery History Society and the British Guild of Beer Writers are holding a joint one-day seminar. The topic will be "Ingredients". To be held at Thornbridge Brewery, Riverside Brewery, Buxton Road, Bakewell, Derbyshire DE45 1GS. We are joining forces with the British Guild of Beer Writers for this one-day seminar on "Ingredients in Beer". Confirmed speakers include: Scott Williams, Williams Bros; Mike Cable, Wild Beer; Toast brewing; Jenn Merrick, brewing consultant and Carl Heron, Crisps Maltings. The day will include a panel debate and a tour of the Thornbridge brewery. We will be providing free transport between the brewery and Sheffield Railway Station. 2.00pm BHS visit to Nethergate Brewery, Rodbridge Corner, Long Melford, Sudbury, Suffolk CO10 9HJ. From 10.30am * CAMRA's annual National Breweriana Auction at Burton on Trent Town Hall. Apart from the auction, which commences at noon, there will be a number of stalls selling brewery memorabilia. Plus beer of course! 12.00 noon * The Brewery Memorabilia Annual Auction returns to the Jubilee Refreshment Rooms, Old Station Building, Sowerby Bridge, West Yorkshire HX6 3AB. All auction proceeds are to benefit the West Yorkshire Forget Me Not Trust, a local children's charity. From 11.00 am for a 12.00 noon start BHS North-West Regional Meeting at the Pavilion, the home of Bank Top Brewery, Ashworth Lane, Bank Top, Bolton BL1 8RA. From 11.30am BHS North-West Regional Meeting at the Tap 'n' Barrel, Hallgate, Wigan WN1 1LR - a Martland Mill Brewery pub. Topics: Meeting of Minds - Members Committee Meeting Discussion - Future topics; Beer Measurement through the Ages - Stewart Thompson (Previous Technical Manager, Higsons Brewery); Know your "Hops" From Decade to Decade -Paul Wood, Head Brewer; Pack of Historical Labels - BHS NW Labologist. The meeting will end at about 2.30pm. A brief brewery tour with transport is available at the end of meeting. There will be a small charge for refreshment. Robin Shacklock has arranged the inaugural meeting for the North-East region at the Bacchus, 42-48 High Bridge, Newcastle City Centre, NE1 6BX. Further details from NE-Region@BreweryHistory.com. From 11.00am BHS North-West Regional Meeting at Lymestone Brewery, Mount Road, Stone, Staffordshire ST15 8LL. A brewery visit and historical chat; Guided tour from Ian (Brad) Bradford - Proprietor and Head Brewer. Lymstone Brewery has risen from the original building of Bents Brewery closed in the 1960s. The tour will include lunch at the Borehole pub (brewery tap) which houses memorabilia from many brewing bygone years. Followed by a walk down memory brewery lane of the town of Stone with a BHS Regional Member. There will be a small charge for refreshment. See a Report of the Visit. 10.00am for 10.30am "Recreating old beer styles". The British Guild of Beer Writers and the Brewery History Society are holding a joint one day conference at Fuller's Brewery, Chiswick Road South, London W4 2QB. The proceedings are expected to finish at about 4.30pm. Following our enormously successful joint seminar at Hook Norton, the British Guild of Beer Writers and the Brewery History Society are holding another one day seminar entitled "Recreating Historical Beer Styles". Historians will discuss old beer styles and the difficulties in recreating recipes from the past. Case studies will be presented from brewers who have recreated beers from the past and we will review whether such beers are just curiosities or represent a real commercial opportunity for today抯 brewers; and if, indeed, old beer styles can be recreated. The workshop is free of charge to members of the British Guild of Beer Writers and Brewery History Society and their guests. 3.00pm BHS London Region visit to Wimbledon Brewery, 8 College Fields, SW19 2PT. Tour and talk to be presented by long-standing BHS member, Derek Prentice. 10.45am BHS visit to McMullen & Sons, The Whole Hop Brewery, 26 Old Cross, Hertford, SG14 1RD. Meet in Reception at 10.45am. Following the tour, there was a tasting of some of the brewery's bottled beers; then a visit to the Woolpack (brewery tap) to sample some draught products. 12.00 noon * Meeting of the Labologists Society at the Brewery Tap, 80 Westgate, Peterborough PE1 2AA. Guests are welcome to attend. There will be a label auction for Labologists Society members only. Brewery walk in Reading. A walk around the remains of Reading's brewery history, led by BHS member Evelyn Williams. 3.00pm BHS visit to the Old Cannon Brewery, 86 Cannon Street, Bury St Edmunds, Suffolk IP33 1JR. There is a charge of � per person for this visit, which includes a pint. 11.00am for 12.00 noon Brewery History Society AGM at Greene King's Brewery, Westgate Street, Bury St Edmunds IP33 1QT. Arrival from 11.00am and meet at the Brewery Tap. The AGM will take place at 12.00 noon, after which there will be lunch and a tour of the brewery. 9.30am for 10.00am (ends at about 5.30pm) * Roll Out the Barrel: Beer, Brewing and Buildings. The Victorian Society study day to encompass a wide range of subjects relating to drinking and brewing. The Art Workers' Guild, 6 Queen Square, London WC1. Topics for the day include: The Buildings of the Malting Industry (Amber Patrick); 慡ome of the Finest Breweries in the Kingdom� William Bradford & Sons, brewers� architects (Lynn Pearson); The Decline and Fall of 慔eavy Wet� (Martyn Cornell); 慡owing that we might reap� the Fall of the House of Allsopp (Ray Anderson); The Way out of Darkest England: the Temperance Movement and its Influence (Andrew Davison); One on Every Corner: what was different about Victorian pubs? (Geoff Brandwood); Saving Historic Pubs (Paul Ainsworth); Whitbread on the Somme? Lloyd George, Beer and the Great War Revisited (Siobhan McGinn). From 11.00am Ken Smith's East End Urban Walk: A re-run (walk!) of Ken's tour of brewing remains of London's East End. Meeting at Stepney Green Tube Station at 11.00am and heading towards the City for a finish around 3pm. 11.00am BHS visit to the Worthington White Shield Brewery, National Brewery Centre, Horninglow Street, Burton upon Trent DE14 1NG. Meet at the Brewery Tap at 11.00am, then a tour with Steve Wellington, head brewer. 12.00 noon * The Summer meeting of the Labologists Society at the Royal Oak, Tabard Street, London SE1. Anyone interested in breweriana especially bottle labels, is welcome to attend. From 11.00am "Burnley the Bygone Years". BHS member John Ingham will be leading a walking tour of Burnley抯 brewery sites, beginning at the Moonstone microbrewery at the Ministry of Ale, 9 Trafalgar Street, Burnley BB11 1TQ . We will aim to take in about 6 former brewing sites; there will be a stop for refreshment at the Bier Huis on the way round, and we will finish at the New Brew-m, the brewery tap for the Reedley Hallows Brewery, where John will give a short talk on the current breweries in Burnley. The meeting is limited to 20 people, and there will be a small charge for refreshments. From 12.00 noon * Tipplefair 2016. The Pub History Society will hold this event at the Peterborough Beer Festival, The Embankment, Bishops Road, Peterborough, PE1 1EF. This is an essential event for all breweriana collectors. 1.30pm BHS visit to Jennings Brewery, Castle Brewery, Cockermouth, Cumbria CA13 9NE. There will be a charge of �per person for this visit. 11.00am to 3.00pm BHS meeting at Morrow Brothers Limited, Unit 7 Ordnance Road, Buckshaw Village, near Chorley, PR7 7EL. The site is near Buckshaw Parkway Railway Station (services between Manchester and Blackpool). Morrow Brothers describe themselves as "World leaders in cask and keg repair ... at the forefront of brewery container repair and refurbishment". We will have a tour of Morrow's state-of-the-art packaging plant; plus three speakers: Amber Patrick BHS Maltings; Phil Lewis - a career within Whitbread and Overseas; and Peter Dickinson Pack of Historical Bottle labels. Lunch and beer at a moderate cost. 11.00am: BHS visit to Marble Brewery, 41 Williamson Street, Manchester, M4 4JS. 3.00pm: BHS visit to Joseph Holt Ltd, Empire Street, Manchester, M3 1JD. 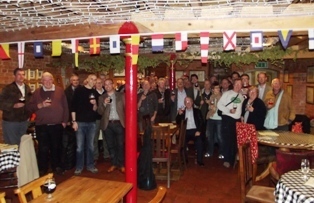 This year our Annual General Meeting was held at Robinson's Unicorn Brewery in Stockport. 11.00am: Assemble at the Visitors Centre, Apsley Street, Stockport, SK1 1JJ, for coffee/tea. 11.30am: Welcome and brief history of the Company � Dennis Robinson, Director. 1.00pm: Buffet lunch and beer tasting � Martyn Weeks, Head Brewer. 2.00pm: Brewery Tour � Martyn Weeks and a tour guide. 11.00am Ken Smith's Urban Walk to Tottenham. A short walk around a number of brewery sites in the Tottenham area. Expected to take about three hours. Guinness Storehouse, archive and new Guinness Brewery. Walk within Dublin to old brewery, distillery sites and historic pubs. Minibus visit to Dublin environs including the Porterhouse Brewery, Ballycoolin; Rye River Brewery, Kilcock; Minch Norton Maltings at Athy; and the Five Lamps microbrewery in Dublin. The party will be a maximum of 12-14 people; cost for the BHS visit programme is about � per person; this will be towards the costs of brewery visit, meals and minibus costs. Make own travel to Dublin and accommodation arrangements. An all-day course organised by the University of Bradford. "This day school looks at the archaeology of drinking, the physical remains � artefacts, buildings and records - of an activity that has reflected so much about societies and their culture." 11.00am BHS visit to Donnington Brewery, Donnington, near Stow-on-the-Wold, Gloucestershire GL54 1EP. There will be a charge of � per head for this trip. 11.00am BHS visit to Belhaven Brewery, Spott Road, Dunbar, East Lothian EH42 1RS. 11.30am to 2.30pm BHS North-West Regional Meeting at Bank Top Brewery, Bolton with brewery tour. From 12.00 noon * Tipplefair 2015. The Pub History Society will hold this event at the Peterborough Beer Festival, The Embankment, Bishops Road, Peterborough, PE1 1EF. This is an essential event for all breweriana collectors. An event organised by Wrexham Museum. Featuring Wrexham Lager and some smaller breweries, demonstrations, talks and displays in the museum. 11.00am Ken Smith's Urban Walk: Chiswell Street to St Pancras. A re-run (walk!) of Ken's tour of brewing sites including Whitbread, Cannon, and others. 11.00am to 3.00pm BHS North-West Regional Meeting at the Tap 'n' Barrel, Hallgate, Wigan - a Martland Mill Brewery pub. Topics -Mish Mash of the Brewery -an Old Higsonian -Stuart Thompson (previously Higsons and Robinsons); GBBF - Past and Last - Dave Sweeney Head Brewer Bank Top Brewery Bolton; From Watney抯 Red Barrel to Cain抯 Bitter - Phil Linley (previously Phipps Brewery � Trumans). After the meeting, a brewery tour is available (15 min drive away): there will be a moderate cost for refreshments of �00 per person. 2pm BHS visit to Crisps Maltings, Great Ryburgh, Fakenham, Norfolk NR21 7AS. 11.00am to 2.30pm BHS North-West Regional Meeting at the Bank Top Brewery Tap, 68-70 Belmont Road, Astley Bridge, Bolton BL1 7AN. This Bank Top Brewery PUB is located at Belmont Road, off the A666 Blackburn Road. Topics - South by Northwest - a Brewer抯 Journey. Stewart Main (previously brewer at Dryborough, Burtonwood, Hook Norton & Shepherd Neame); Brewing at seven Historic Breweries - Phil Linley (previously Head Brewer Higsons); Discover the Historic Age of Cask Ales, Dave Sweeney Head Brewer Bank Top. There will be a moderate cost for refreshments of �00 per person. Existing members are encouraged to invite new members who share our passion of our Brewing Heritage. 12.00 noon * Brewery Historians Charity Section (BHCS). Christmas social, swap session and auction at the Hope Inn, 118 Wellington Road North, Stockport SK4 2LL. This will be the 21st of the charity socials. So far the events have raised �766.17. Breweriana will be sold or auctioned with proceeds going to a local charity. Any donations of brewery items welcomed. 10.30am BHS visit to Elgood & Sons Ltd, North Brink Brewery, Wisbech, PE13 1LW. Beginning at 10.30am, a tour of this classic Georgian brewery led by Head Brewer Alan Pateman, followed by beer tasting and a buffet lunch in a nearby pub. In the afternoon, a town walk of local brewery and related sites (Union Brewery, Oak and maybe Phillips brewery), led by Alan Pateman. Finish at approximately 4.00pm with a visit to another local pub. 2.00pm BHS visit to Kingstone Brewery, Meadow Farm, Tintern NP16 7NX (off the A 466). This microbrewery was set up in 2005 as a 4 barrel brewery producing both draught and bottled beers. Suggested meeting point is 12.45pm: Meet for an own arrangement lunch at Brockweir Country Inn, NP16 7NG (they do baguettes and have Kingstone draught beer) (www.thebrockweirinn.co.uk) before departing at 1.45pm to Kingstone Brewery (about 3 miles away). We assemble at the brewery at 2.00pm. A tour of the brewery is led by brewer Mark Gardner, followed by a short beer tasting. We finish and disperse about 4.00-4.30pm. For those visiting Magor, it is about 17 miles (40 minutes) drive. 6.00pm BHS visit to ABInBev's Magor Brewery, Wilcrick, Magor NP26 3RA - built by Whitbread and commissioned in 1979. They currently produce a mix of ABInBev branded lagers and ales. Suggested meeting point is about 5.00-5.15pm at the Wheatsheaf Inn, Magor NP26 3HN. Meet at Magor Brewery entrance (approximately 2 miles west of the village) by 6.00pm. We will have a brewery history talk, and a tour of the plant to view the main brewing operations - possibly followed by a beer tasting. Our host is Brewery Manager Mr Tony Monteiro. Expected finishing time is 8.00-8.30pm. 11.00am for 11.50am The Brewery History Society AGM at SA Brain Brewery, Crawshay Street, Cardiff, CF10 1SP. Assemble at the Reception / Visitor Centre from 11.00am. The AGM is at 12.00 noon, followed by an introduction and brief history of the brewery by Bill Dobson, General Manager and Head Brewer; then a Buffet lunch and beer tasting. From 2.00pm, a brewery tour. The AGM is of course open to all members, but names for the brewery tour are accepted on a first come / first served basis. The visit will end at approximately 4.30pm. evening From about 6.00pm, we are planning informal visits to: the Urban Bar - Tiny Rebel Bar - in Westgate opposite the Millennium Stadium; ZeroDegrees (brewpub), 27 Westgate, Cardiff CF10 1DD (tbc) - one of 4 UK brewpubs www.zerodegrees.co.uk; and to the site of the old Brain's brewery (now a pub) in Cardiff centre. 10.30am BHS visit to Otley Brewery, Unit 39, Albion Industrial Estate, Cilfynydd, Pontypridd CF37 4NX. A tour of this successful microbrewery - established 2005 - with a beer tasting led by Nick Otley, the Proprietor; followed by a luncheon bite at his nearby pub, the Bunch of Grapes Pontypridd. There will be small charge for this brewery visit (including lunch plate). 1.00pm for 2.00pm A two-day visit to Glasgow. BHS visit to the Scottish Brewing Archive. We assemble at a local pub in time for a 2pm visit to the Scottish Brewing Archive, with talks by both our hosts at the Glasgow Archive Services and John Martin of the SBAA. Our visit ends at approximately 4.00pm, when we will visit nearby historic pubs led by the SBAA. 10.30am BHS visit and tour of the Tennents Brewery, Wellpark Brewery, Duke Street, Glasgow, and the new Drygate Brewpub, a joint venture by Tennents and Williams Brothers - on the same site. 2.00pm BHS visit to West Brewery, Binnie Place, Glasgow Green - a lunch followed by a brewery tour of this modern German-style brewpub. There will be a charge for this visit. From 10.15am A two-day visit to Winchester and Alton. The programme has been prepared and will be led by BHS member Sue Bell starting 10.15 at Winchester College Brewhouse. Then lunch - a Winchester Huff and beer at nearby Wykeham Arms (SO23 9PE). In the afternoon, an urban walk to visit the recently excavated St James Brewery site; then Hyde Abbey, Winnal and Marston's brewery sites; finishing via two local Micro Breweries - Red Cat and Alfred's. Finishing at 6.00pm. From 10.00am We continue our Hampshire expedition by visiting Molson-Coors brewery at Alton (GU34 2PS), led by Mark Dobnor, Brewing Manager. Talk and exhibition by BHS member Geof Dye at the Railway Inn, followed by a ploughmans lunch. In the afternoon, a walk led by Sue Bell using the 1666 Alton map to visit old malting & brewery sites; finishing at the Allen Gallery for a short talk on Baverstock brewery. At 4.30pm, we depart for Andwell Brewery , North Wanborough (RG27 1HA) for a visit at 5pm, finishing at approximately 6pm. A walk to brewery and maltings sites in Ipswich, planned by the late Colin Bridgland. 10.15am We continue our Suffolk expedition by visiting Adnam's brewery and distillery at Southwold. Assemble at the brewery at 10.15am. Our guide is head brewer Fergus Fitzgerald. We conclude with beer tasting, and our visit finishes at about 1.00pm. BHS overseas visit to Berlin. Based in Berlin for 4 days, make own travel to Berlin and accommodation arrangements in Berlin. Visits to include: The only remaining large brewery, Kindl Schultheis Brauerei; Brewing School and pilot brewery, maltings and brewing library at VLB Berlin University; city walk(s) visiting closed brewery and malting sites (Botzow, Konigstadt, KulturBrauerei) and several new micro breweries, some in old brewery / malting buildings; a day in Potsdam for more historical brewing and current microbrewing / pub scene. Plus an urban walk through an historic and the new brew pub area of Berlin. Our link in Berlin is Michaela Knoer - Librarian at the VLB Brewing Historical Society, who we met up with in Bamberg last year. From 10.30am Commencing at 10.30am, we visit Revolutions Brewery, Castleford, WF10 5PX. Then at 2.00pm at Fawcetts Maltings at Castleford, WF10 4LE. 10.30am "Beer writing � past, present and future". The British Guild of Beer Writers and the Brewery History Society are holding a joint one day seminar at The Hook Norton Brewery, Brewery Lane, Hook Norton, Oxfordshire OX15 5NY. This will review how beer writing has developed over the past two hundred years; examine coverage of beer in the modern media and explore how beer communication might evolve in the digital age. Contributions by James Clarke, James Sumner, Ray Anderson, Ray Newman, Marverine Cole, Nick Stanhope, Adrian Tierney-Jones. The seminar is followed by a brewery tour and a beer or two! The workshop is free of charge to members of the Guild and the Brewery History Society and their guests. There is a fee of � for non-members. 12.00 noon * Brewery Historians Charity Section (BHCS) Christmas social, swap session and auction at the Hope Inn, 118 Wellington Rd North, Stockport SK4 2LL. In the 19 meetings since 1995, over �400 has been raised for charity. 2.00pm BHS visit to AB-InBev's Samlesbury Brewery - Cuerdale Lane, Samlesbury, Lancs, PR5 0XD. Built by Whitbreads in 1972. A tour and beer tasting led by Brewing Manager Christopher Deakin. 11.00am for 11.50am The Brewery History Society AGM at Thwaites's Star Brewery, Penny Street, Blackburn BB1 6HL. Assemble in Reception / Visitor Centre. The AGM is at 12 noon, followed by a buffet lunch and tours of the brewery. The visit ends at 4.30pm. 6.00pm: Informal BHS visit to 3 Bs Brewery, Black Bull, Tockholes, near Blackburn, BB3 0LL. Saturday 27 April 2013 10.00am: BHS visit to Irwell Works Brewery, Irwell Street, Ramsbottom BL0 9YQ. Tour of the brewery and beer tasting. 12 noon: BHS visit to Bank Top Brewery, Ashworth Lane, Bank Top, Bolton BL1 8RA. Tuesday 14 May to Saturday 18 May 2013 BHS visit to Bamberg. This German world heritage town has at least seven breweries and two maltings; many exceptional beer kellers and beers; plus lots more brewery and heritage sites. Guests will make their own travel and accommodation arrangements to fit a 3-4 day programme in Bamberg, to include Weyermann's maltings (which has its own microbrewery), and 3-4 Bamberg breweries including some keller and brewery hospitality. The party will be a maximum of 12. A charge of about � per person will be toward the costs of the local brewery, maltings and keller visits. 1.00pm BHS visit (in conjunction with members of the Scottish Brewing Archive) to Cameron's Brewery Ltd, Lion Brewery, Stranton, Hartlepool, TS24 7QS. Founded 1865. 1.00pm: Assemble at the Brewery Reception / Visitor Centre for buffet lunch and brewery history. 2.00pm: Tour of the brewery and beer tasting led by Director of Brewing Martin Dutoy. 4.00pm: Talk by Peter Maule (retired brewer and malting chemist): 'A Tale of Three Breweries - the Delaval Breweries of the Berwick area'. 5.30pm: Disperse from Camerons, followed by a visit to some historic Hartlepool brewery/hostelry sites in the vicinity of the brewery. From 10.00am BHS Day visit to Ware and Stanstead Abbots. 10.00am: Assemble at French & Jupp Ltd, Roydon Road, Stanstead Abbots, SG12 8HG. Maltsters and malt roasters since the 1600s. Visit the plant led by former Chairman Guy Horlock. 12 noon: lunch break at a pub in the village. 1.45pm: Assemble in Ware (approximately 5 miles from Stanstead Abbots) at Waggers Bar (part of 1840s malthouse of Dickenson), Kibes Lane, Ware, SG12 7BS. 2.00pm: Urban walk in Ware led by BHS member Colin Bridgland to visit the many old brown malt malting buildings and old brewery sites including Star Street, High Street, New Road, Star Brewery, Bluecoat Brewery, and many other locations. Finish at about 6.00pm. A small charge is payable for the maltings visit and lunch. 12.00 noon to 5.30pm * Tipplefair 2013. Organised by the Pub History Society, Tipplefair 2013 is an essential event for all breweriana collectors. This will be held at the Peterborough Beer Festival, The Embankment, Bishops Road, Peterborough, PE1 1EF. The Beer Festival is open all day until 11.00pm. From 12.15pm BHS visit to JC and RC Palmer, Old Brewery, Bridport, DT6 4JA. We meet at the Crown Inn, West Bay Road; then from 2.00pm, a tour of the brewery and beer tasting led by Head Brewer Darren Batten. We finish at about 5.00pm. * Brewery Collectibles World Convention, Martin, Slovakia. BHS Urban Walk/Ride around South-West London, led by Ken Smith. Visiting the remains of the New London Brewery, Plowman Barrett and Thomas Woodward, perhaps some others. A bus pass or Oyster Card is required. From 10.30am BHS visit to Wrexham. To view the new Kaspar Schulz brewery built in 2011 for Wrexham Lager; followed by beer tasting, lunch, and a gentle urban walk to view some of the sites of old Wrexham breweries. The walk is led by local BHS member Derek Jones. Derek and his wife Beryl are authors of the book Wrexham Breweries and Inns 2001. 12.00 noon * Brewery Historians Charity Section (BHCS) Christmas social, swap session and auction at the Jubilee Refreshment Rooms, Sowerby Bridge Station, Yorkshire HX6 3AD. In the 18 meetings since 1995, over �000 has been raised for charity. 10.30am 10.30am: Assemble outside outside Camden Town Underground Station at Camden High Street entrance, for a short urban walk via the old Camden brewery site/stores building 1890 (Hawley Crescent); and the site of Tuckers Chalk Farm Brewery. At 11.30am, BHS visit to Camden Town Brewery, Wilkin Street Mews, Kentish Town, London NW5 3NN. A visit to this micro which was set up in 2006 and transferred to this site in 2010. View the brewery followed by beer tasting with Mark Dredge. 3.00am BHS visit to Brodie's Brewery, Leyton, London. Meet at the brewery tap, King William IV, 816 Leyton High Road, E10 6AE. A visit to this micro which was set up in 2008. 11.00am for 11.45am The Brewery History Society AGM. Fuller's Brewery, Griffin Brewery, Chiswick Road South, London W4 2QB. Starting in Fuller's Hock Cellar, Chiswick Lane from 11.00am. Following the AGM, a buffet lunch and brewery tours. The visit ends at 4.00pm. In the evening (6.00pm) a visit to Twickenham Brewery, Rycroft Works, Edwin Road, Twickenham TW2 6SP. 11.00am 'North Kent Meander'. BHS minibus tour of brewery sites between Bexley and Chatham, led by Ken Smith. Starting at Dartford Rail Station at 11.00am. The tour finishes at Dartford at approximately 5.00pm. There is a charge for this visit to cover minibus transportation. 8.00pm * Following the Burton Civic Society AGM, Malcolm James will talk about his six years of research into the use and re-use of brewery buildings. This takes place at about 8.00pm at the Worthington Suite of the National Brewery Centre, Burton upon Trent. From 3.00pm A two-day visit to Edinburgh. 3.00pm: BHS visit to Stewarts Brewery, Loanhead, Edinburgh EH20 9LZ. Visit the brewery led by the owner Steve Stewart. 6.30pm: Visit the SIBA Scottish regional beer competition at the Corn Exchange, Newmarket Road, Edinburgh EH14 1RJ for beer tasting at the Trade session. From 10.30am 10.30am - 4.00pm: Joint meeting with the Scottish Brewing Archive Association (SBAA) - to include a walking tour of the old brewing sites in Edinburgh plus some traditional Edinburgh pubs. 5.00pm: BHS visit to Caledonian Brewery, Slateford Road, Edinburgh EH11 1PH, finishing with a beer tasting. 7.00-7.30pm: Visit a nearby historic pub for farewell refreshment. From 2.30pm A two-day visit to Norfolk. 2.30pm: BHS visit to Woodforde Brewery, Woodbastwick, Norfolk NR13 6SW; finishing at 6.00pm. Evening: an urban walk of Norwich old brewery sites (3-4 breweries). 10.30pm 10.30am - 2.30pm: BHS visit to the History of Advertising Trust (HAT) and museum, Raveningham, Norfolk NR14 6NU. This is the new home to a major part of the BHS archive from Birmingham. A joint launch with HAT and BHS of the BHS Archive. After a buffet lunch, the event closes at 2.30pm. 2.30pm BHS visit to Hall & Woodhouse Brewery, Blandford St Mary. Visit the old and new breweries. Start at 2.30pm at the Brewery Visitor Centre. From 12 noon * Tipplefair 2012. Now organised by the Pub History Society, Tipplefair 2012 - an essential event for all breweriana collectors - will be held at the Peterborough Beer Festival, The Embankment, Bishops Road, Peterborough, PE1 1EF. 2.30pm A two-day visit to Kent. 2.30pm: BHS visit and hop picking at the Wye Dwarf Hops Research Station, near Canterbury (CT2 9AR). Dr Peter Darby, the hop breeder, will explain the research and breeding programme; followed by visits to the experimental plots and to a commercial hop farm next door. Close at about 5.00pm. 10.30am 10.30am: BHS urban walk of Canterbury malting and brewing sites, led by BHS member Colin Bridgland. 10.30am 10.30am: BHS visit to Timothy Taylor's Brewery, Keighley, Yorkshire. There will include a full morning of brewing and brewery site visits including their new cask filling facilities; finishing with a beer tasting led by Head Brewer Peter Eells. The visit closes at about 3.00pm. 12.00 noon * Brewery Historians Charity Section (BHCS) Christmas social, swap session and auction at the Jubilee Refreshment Rooms, Sowerby Bridge Station, Yorkshire HX6 3AD. 2.00pm BHS Walk. Ray Anderson leads a tour of some of Burton's brewing and malting sites, extant and extinct, on the Friday afternoon before the SHIER Conference. The walk starts from Burton-upon-Trent Railway Station at 2.00pm. and lasts for about three hours ending in a pub. The conference launches and discusses the results of the BHS SHIER (Strategy for the Historic Industrial Environment Report) project, and looks at England's remaining historic brewing buildings and plant. National Brewery Centre, Burton-upon-Trent: Worthington suite. More details about the BHS Conference 2011. Brewery History Society AGM. Marston Banks's Brewery, Park Brewery, Brewery Road, Wolverhampton WV1 4PR. Marston's Training Centre, Summerfield Road (rear of the brewery). Followed by a tour of Banks's Brewery in the afternoon. In the evening (6.00pm), an informal visit to Sarah Hughes Brewery, Beacon Hotel, Sedgley DY3 1JE, including a brewery tour. 11.00am BHS informal visit to Ma Pardoe's (Old White Swan) Brewery, 89 Halesowen Road, Netherton, West Midlands DY2 9PX; including a short tour of the brewery. From 9.00am * Tipplefair 2011. Buckingham Community Centre, Cornwalls Meadow, Buckingham, MK18 1RP. Beer, spirits and drink-related collectables. Real ale bar from 11.00am. 11.00am Ken Smith's third walk around the brewing sites of London. This one from Chiswell Street to St Pancras, incorporating Whitbread, Cannon, and other sites of brewing relevance. 12.00 noon * Brewery Historians Charity Section (BHCS) meeting, swap session and auction at the Jubilee Bar, Sowerby Bridge Station, Yorkshire. All money raised will go to the Overgate Hospice, Elland, Yorkshire. BHS visit to Dublin. Wednesday 4.00pm: Old Jameson Distillery, Bow Street Museum, Dublin. Followed by a guided visit to some Dublin historical hostelries in the evening. Thursday 10.30am - 4.00pm: Guinness Brewery, historical buildings, Store-house Museum and Archives (meet the Guinness archivist); including lunch and Guinness tasting. from 10.30am BHS visit to Nottingham city. Beginning at the Prince of Wales (Hutchinson's) brewery in Basford, used by Murphy & Son Ltd for the supply of products to breweries. Then a walk via Shipstone's Maltings and Brewery to the Nottingham Brewery in Radford; finishing with a tour of Castle Rock Brewery. from 10.15am BHS visit to Newark, Nottinghamshire - Malting and Brewing Trail, led by BHS member Colin Bridgeland. We start at Warwick & Richardson's former brewery in Northgate, and a visit to the Maltsters Association of GB; then a walk around Newark which covers sites of 8 breweries (including Trent Brewery, Holes, Town Wharf Brewery), and about 26 maltings (many with remains). Lunch at the Fox & Crown, Appleton Gate. from 9.45am BHS Minibus tour of Tring and the Vale of Aylesbury. Includes several former brewery sites, and the recently relocated Tring Brewery. Begins at Leighton Buzzard Rail Station at 9.45am. Lots of stops at defunct brewery and malting sites in the eastern part of the Vale & Tring. The trip is limited to 20 persons and there will be a small charge which will be collected on the day. 12.00 noon * Brewery Historians Charity Section (BHCS) Christmas social, swap session and auction at the Jubilee Bar, Sowerby Bridge Station, Yorkshire. All money raised will go to the Overgate Hospice, Elland, Yorkshire. 11.00am BHS Walk (guide Ken Smith) around the brewing sites of Southwark. Starts from the East Side Centre of Southwark Bridge at 1100. Approximate finishing time 1400. Featuring the sites of Barclay Perkins, Courage and Sarson's Vinegar Brewery. Brewery History Society AGM. Wadworth's Brewery, Northgate Brewery, Devizes, Wiltshire SN10 1JW. From 9.00am * Tipplefair 2010. Buckingham Community Centre, Cornwalls Meadow, Buckingham, MK18 1RP. Beer, spirits and drink-related collectables. Real ale bar from 11.00am. From 10.30am BHS visit to Oxford and Witney. 1030: meet at Oxford railway station forecourt to catch public bus to Oxford Brookes University Gypsy Lane campus, Headington, Oxford OX3 0BP. 1100-1200: a visit to the National Brewing Library (www.brookes.ac.uk/library); then return to the rail station for: 1230-1430: an urban brewery walk to view old brewery/malting sites including Morrell's and Hall's; then 1530 to approx 1800: a visit to Marston's-owned Wychwood Brewery, Witney OX28 4DP (www.wychwood.co.uk) on the site of the Clinch Eagle Brewery and Maltings. From 10.30am BHS visit to Herefordshire. 1030: Wye Valley Brewery located in the former Symonds Cider plant at Stoke Lacy, HR7 4HG (www.wyevalleybrewery.co.uk). 1400: an afternoon tour of Pridewood Farm, Ashperton, Herefordshire HR8 2SF to view hop picking, drying and packaging. 7.30pm * Talk: 'The business of hops in the 19th century' by BHS member Peter Tann. Drill Hall, Preston Street, Faversham, Kent. BHS members welcome. 18-20 October 2010 * International Brewing Convention, Manchester. Institute of Brewing & Distilling and the Beer Academy (www.ibcmanchester.org). Members of the BHS Committee attended and ran a stall. Chris Marchbanks also represented the National Brewing Library. The event comprised a conference, and an exhibition of suppliers' stands. We were part of the exhibition and did not attend the conference. 12.00 noon * BHCS meeting at the Jubilee Bar, Sowerby Bridge Station, Yorkshire. All money raised will go to the Overgate Hospice, Elland, Yorkshire. From 10.00am BHS visit to the Beamish & Crawford brewery, prior to its closure in March 2009. Brewery Reception, Beamish & Crawford plc, The Brewery, South Main Street, Cork City, Ireland. 1800-2100: IBD Midland Section AGM (BHS members welcome); followed by paper 'The Origins of Porter' by Dr James Sumner - Lecturer in The History of Technology, Manchester University; followed by a tasting of bottled Porters and buffet supper. 7.00pm BHS visit to Hydes Brewery, 46 Moss Lane, Manchester M15 5PH. From 11.30am Brewery History Society AGM. J W Lees' Greengate Brewery, Lees Street, Middleton Junction, Greater Manchester M24 2AX. 5.00pm BHS visit to the Royal Brewery, Denmark Road, Manchester M15 6LD. 11.00am BHS visit to Phoenix Brewery, Green Lane, Heywood, Greater Manchester OL10 2EP. Established as the Oak Brewery in 1982 - moved into this late-19c brewery building in 1991. 12.00 noon * The Association for British Brewery Collectables (ABBC) are holding a breweriana meeting at Milk Street Brewery, Frome, Somerset, BA11 3DB. See the ABBC web site. BHS members are welcome to attend, and a brewery visit is included. From 9.00am * Tipplefair 2009. Buckingham Community Centre, Cornwalls Meadow, Buckingham, MK18 1RP. Beer, spirits and drink-related collectables. Real ale bar from 11.00am. 11.00am BHS visit to Harvey's Brewery, 6 Cliffe High Street, Lewes, Sussex BN7 2AH; followed by a walking tour seeing the historical brewing and political sites of the town. 11.00am BHS Walk (guide Ken Smith) - about three hours - around the brewing site remains of the East End of London, including Charrington, Mann Crossman & Paulin, Truman Hanbury & Buxton, John Furze, Best & Co, Tilney & Co. The walk starts at Stepney Green Tube Station. 7.30pm * An English Project Talk: 'The Language of Beer'. Professor Christopher Mulvey talks about beer, the language of beer and the mysteries of brewers' lingo. Warren Hall, Micheldever Station, near Winchester, Hampshire SO21 3AR. BHS members welcome. 12 noon * Historians and Collectors Social (HACS). A social event at the Grove Inn, 2 Spring Grove Street, Huddersfield for brewery historians and collectors (a social gathering!). Includes a raffle and auction and attendees are invited to bring along any items of brewery / historical / collectable interest and information. 11.00am BHS visit to Hook Norton Brewery, Hook Norton, Oxfordshire. 12 noon * Peterborough Breweriana Extravaganza - British Brewery Playing Card Society. Coalheavers Arms, Park Street, Peterborough. From 9.00am * Tipplefair 2008. Buckingham Community Centre, Cornwalls Meadow, Buckingham, MK18 1RP. 11.30am for 12 noon Brewery History Society AGM. Arkell's Brewery, Swindon, Wiltshire. 11.00am BHS visit to Wickwar Brewery, The Old Brewery, Station Road, Wickwar, Gloucestershire. BHS visit to this very successful brewery which started life as a 1990 micro in the former coopers' shop of the Arnold Perrett Brewery, and has expanded into the fascinating 19c main brewery buildings. 11.00am BHS visit to Tetley's Brewery, Hunslet Road, Leeds, Yorkshire. 1.00pm BHS visit to Highgate Brewery, Sandymount Road, Walsall. From 11.30am Brewery History Society AGM. Shepherd Neame's Brewery, Faversham, Kent. 11.00am Joint visit with ABBC at the Badger Brewery, Hall & Woodhouse, Blandford Forum, Dorset. Sunday 20 May 2007 * Tipplefair 10, Milton Keynes. 11.00am BHS visit to Thwaites Brewery, Blackburn. 12 noon * A social event at the Grove Inn, 2 Spring Grove Street, Huddersfield for brewery historians and collectors (a social gathering!). Includes a raffle and auction and attendees are invited to bring along any items of brewery, historical or collectable interest and information. Saturday 18 February 2006 * Joint BHS / ABBC Social Meeting, Hosted by BHS Corporate Member Gary Burlison at The Merchant's Inn, Rugby. Saturday 25 February 2006 * Joint BHS / Victorian Society Study Day: 'THE BREWING AND LICENSED TRADES, 1800-1914'. 2.15 pm BHS visit to George Gale & Co., Horndean, Hampshire. STOP PRESS: Sorry, unfortunately Gales have had to cancel this trip. Friday 21 April 2006 BHS AGM Hosted by Hardys & Hansons Kimberley Brewery, Kimberley, Notts. 11am BHS visit to Warminster Maltings, Warminster, Wiltshire. Sunday 21 May 2006 * Tipplefair 9, Milton Keynes. 12 noon BHS visit to JC & RH Palmer Ltd, West Bay Road, Bridport, Dorset. 11am BHS visit to Elgood & Sons Brewery, North Brink, Wisbech. 12.30pm BHS visit to Young's Brewery, High Street, Wandsworth. 2.30pm BHS visit to Greene King's Brewery, Westgate Street, Bury St Edmunds. At the St Stephen抯 Tavern, 10 Bridge Street, London SW1 (opposite the Houses of Parliament). Wednesday 2 March 2005 BHS Visit to the Tyne Brewery, Newcastle upon Tyne. Friday 22 April 2005 BHS Visit to the Guinness Brewery, Park Royal, London. Saturday 7 May 2005 BHS AGM. Hosted by Batemans Brewery, Wainfleet, Lincolnshire. Sunday 22 May 2005 * Tipplefair, Milton Keynes. Friday 1 July 2005 BHS Visit to the St. Austell Brewery, Cornwall. Friday 16 September 2005 BHS Visit to Ridley's Brewery, Hartford End, Essex. Thursday 22 September 2005 BHS Visit to Wolverhampton & Dudley Maltings: Langley, West Midlands and Lichfield, Staffs. Saturday 24 September 2005 BHS Visit to the Hogs Back Brewery, Farnham. Friday 14 May 2004 Brewery History Society AGM. Young's Brewery, Wandsworth, London. Sunday 23 May 2004 * Tipplefair 7, Milton Keynes. Saturday 23 October 2004 BHS visit to three breweries on the Isle of Wight: Ventnor; Yates (St Lawrence); Goddard's (Ryde). Thursday 26 November 2004 BHS Visit to the Fountain Bridge Brewery. Saturday 8 February 2003 BHS visit to JW Lees & Co. Middleton Junction, Manchester. Thursday 13 February 2003 BHS visit to Adnams Brewery, Southwold, Suffolk. Wednesday 30 April 2003 BHS visit to Frederick Robinson Ltd., Stockport. Friday 16 May 2003 BHS AGM. Hosted by Everards Brewery, Narborough, Leicester. Sunday 18 May 2003 * Tipplefair 6, Milton Keynes. Friday 13 June 2003 Joint BHS / English Heritage / AIA Conference - 'From Grain to Glass', Swindon. Saturday 14 June 2003 * Joint Society Social at St Neots arranged by the BBPCS. Saturday 28 June 2003 BHS Visit to Marstons Brewery, Burton on Trent. Saturday 6 September 2003 Another BHS / ABBC organised joint Society social at Histon. Always a great day. Friday 19 April 2002 BHS AGM. Hosted by John Smith's Brewery, Tadcaster. Saturday 4 May 2002 * Charity Brewery Fair. Stalybridge Station Buffet. Sunday 26 May 2002 * Tipplefair 5, Milton Keynes. Saturday 22 June 2002 * Joint Society Social at St Neots arranged by the BBPCS. Monday 12 August 2002 BHS Visit to the Thomas Hardy Brewery - Eldridge Pope, Dorchester. Saturday 7 September 2002 Another BHS / ABBC organised Joint Society Social at Histon. Wednesday 16 October 2002 BHS Visit to the BRi. Friday 25 October 2002 BHS Visit to M&B's Cape Hill Brewery. See Photographs of this excellent visit. Saturday 8 September 2001 Another BHS / ABBC organised joint Society social at Histon. See Histon report for a look at last time. Sunday 30 September 2001 * Tipplefair 4, Milton Keynes. Monday 17 December 2001 BHS visit to the Castle Eden Brewery. Friday 28 April 2000 BHS AGM. Hosted by Cameron's Brewery, Hartlepool. 12.00 - 6.30pm. * Scottish Brewing Archive Open day. Saturday 17 June 2000 Corporate Member meeting at Kelham Island Brewery, Sheffield. 1.30pm - 4.30pm Public Houses Research Project, East Grinstead. Saturday 20 August 2000 Hops, Hogs & Harleys. The Old Kiln Museum, Farnham. Friday 1 September 2000 Corporate Member meeting at Ushers, Trowbridge. Saturday 2 September 2000 * Faversham Hop Festival. Shepherd Neame Brewery open to the public. Saturday 16 September 2000 BHS visit to Shepherd Neame Brewery, Faversham.